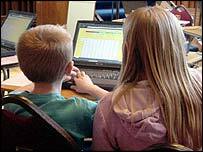 Today is Safer Internet Day – a day designed to help children to learn essential skills about safe social networking. This year’s theme, ‘It’s more than a game, it’s your life’, aims to get people thinking about safe and responsible use of the internet and social networking sites and highlights the importance of protecting privacy and digital reputation as well as the need for good online etiquette. Control your digital reputation – things you post online now can affect you in the future. Protect your privacy – make decisions about who sees your information. Be a good friend – treat others online as you want to be treated. Safer Internet Day activities in Australia are coordinated by the Australian Communications and Media Authority (ACMA) as part of its cybersmart program. For resources and more information visit the ACMA cybersmart website. There are quite a few good ideas over at Teaching Themes Staying Safe Online page. I included the Harry the Hacker activity (an activity asking how we can keep our passwords safe) on my homework sheet this week and I am looking forward to the answers coming back. Today we completed the “Who Would you Tell?” activity (an activity about Personal Information) and “True / False” (to see if kids could work out if someone was lying). I was really impressed with these activities. Barbie Site – Not Appropriate??? These ads are becoming too much – this came my way via Twitter, and shows why you can’t think everything is OK because the children are on a “child” site. Supervision is still required. Take a look at the ad that appeared on Barbie.com recently. Another News Report which came across my screen, this time about Parents who took control of and posed as their 11yr old daughter on Facebook to trap a pervert. Very worrying and something all parents and teachers need to be aware of – Internet Safety has to become everyone’s business.